Regular servicing and general maintenance of your car is essential to ensure trouble free motoring. We provide high quality vehicle servicing with exceptional value for money and unrivalled customer service. Servicing your vehicle is essential for keeping up with maintenance and manufacturer’s recommendations. Unlike an MOT test, carrying out a service on your vehicle is not a legal requirement under UK law however it does promote hassle free motoring and regular maintenance of your vehicle will enhance the lifespan of part and reduce bills in the long run. 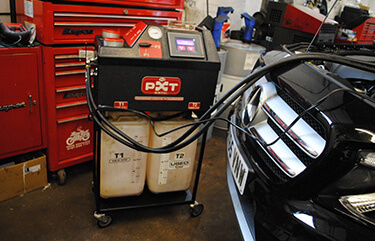 Vehicle servicing doesn’t need to be carried out by a main dealer, and therefore doesn’t have to be costly. We are proud to be Mini, Audi, Skoda, Seat and Volkswagen specialists. This means, where applicable, your warranties will be maintained and all servicing will be carried out to the specifications set out by the manufacturer. In addition, our team are professionally trained and have expert knowledge in servicing all makes and models of vehicles. Our friendly and local staff will take care of your vehicle and ensure that your vehicle receives the TLC it deserves. Not only will your vehicle run smoother after a service, but you will also have peace of mind, knowing that your vehicle has been thoroughly checked and repaired, where necessary. If you have an MOT test due, not only can we carry out the test for you from our Bromley garage, but we can also arrange Pre-MOT servicing should you be concerned about your vehicle potentially not passing the MOT first time. 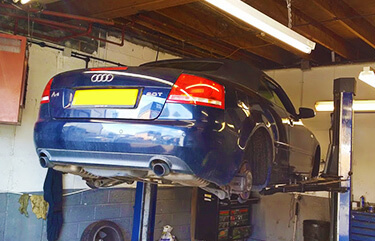 If you would like us to also carry out your MOT test, we can do so in our MOT test centre in Bromley. We guarantee that you'll make major savings on your car servicing bills at Bromley Car Repairs. A well looked after vehicle can lead to an increased resell price and/or a quicker sale. A vehicle being sold with some service history, or better still full service history will fetch a higher asking price when you come to sell it. Servicing your car and carrying out vehicle repairs as soon as they are needed will ensure your car runs more smoothly and by keeping on top of general wear and tear, parts will last longer and breakdowns will be reduced. If your vehicle requires a clutch repair or suffers a puncture, the symptoms are clear to see and rectify. A service by a professional will pick up on the issues with your vehicle that you cannot always see or may not notice. A fully serviced car is a safer one. Planning your services and budgeting for them will cut down on emergency car repair work, which can put a strain on both your bank balance and your time. By carrying out regular vehicle maintenance, you can take control of unexpected costs. Our car repair plan (below) can also help to budget your finances. We offer a payment plan, as part of the Car Repair Plan (CRP) so you can spread the cost of your yearly service or any unsuspected repairs. You can use any CRP garage to have your works completed and pay for it from your fund. If you’re a regular customer of ours and you can't get to a CRP garage, you can have the repairing garage send an invoice to us for any works and we'll redeem the funds from your CRP payment plan, as long as there are sufficient funds in your account. For more information about our payment plan, please get in touch. Getting your car serviced annually, or at manufacturer’s recommended frequency, is the best way to keep your maintenance costs down and keep your car on the road for longer. During a service, we will complete all standard checks, including oil check, filters, belts, tyre pressure and more. Unlike an MOT test, which is mostly checking for safety, servicing covers any parts of the car which may soon be in need of repair, and any manufacturer’s guidance, such as replacing a cam belt when the car reaches a certain age or mileage. Catching any issues during a service will reduce the risk of any faults occurring when you are on the road, which could not only be dangerous but potentially more costly. Another great benefit is a potential increase in the resale value of your vehicle, regular servicing, recorded in the servicing history show that due care and attention has been given to the car and that any potential issues have been highlighted and addressed. Booking a service with Bromley Car Repairs couldn’t be easier, just give us a call and we’ll find the next available appointment to suit your schedule. Our services our carried out to your manufacturer’s specification and our team is highly experienced with all makes and models. As with any servicing, there are standard checks that we will complete and many tasks are undertaken as part of the service, such as changing the oil and replacing filters. If any additional work is identified as part of the service, we will always advise you before any work is undertaken so that you understand the need for the work and the associated cost. We always use OE parts when completing repairs and we will keep your log book up to date with the work completed. All of our work comes with a 2 year or 20000 mile guarantee so you can trust us to get you back on the road safely. We will always take care of your vehicle to the highest standards, our service is honest and transparent and we will cost less than a main dealer! All of our vehicle repairs are carried out on site by our own mechanics, and are guaranteed for 2 years or 20,000 miles. Only genuine or quality Original Equipment (OE) parts will be fitted. We cover all work from bulb changes, tyres, exhausts, seasonal checks and MOT testing right through to major engine and gearbox repairs. Many main dealers will charge upwards of 50% more than an independent service and car repair centre and in some cases, this is purely down to the endorsement over the door. Many of the diagnostics and rigorous vehicle checks we carry out during a full service are exactly the same procedures as followed by a main dealer, so there’s really no reason to pay more. We are specialists in VW, AUDI, SEAT, SKODA collectively known as (VAG group). We also service BMW Minis, and are fully qualified to carry out servicing, repairs and diagnostic work to main dealer level and beyond. One of our team will always advise you of any additional work that may be required and the costs involved before any work is carried out. Only once these costs have been approved by you, will the work be completed accordingly. This guarantees that you are kept informed at all times of what your vehicle repairs will cost, and avoid any nasty surprises. It is vital for your safety and others that your brakes are checked regularly. Our brake safety checks involve inspecting and measuring the brake disc and pad thickness to check their serviceability, inspection and adjustment of brake shoes and drums (if fitted) and inspection of all brake pipes and hoses for corrosion and damage. Most manufacturers recommend a brake fluid change every 2 years regardless of mileage which we can also do on site. Tyres are often overlooked for maintenance with attention given to the engine instead. However, looking after your tyres is an essential part of vehicle maintenance. Drop in for a free tyre check and we will check the tread and air pressure to keep you safe on the road. 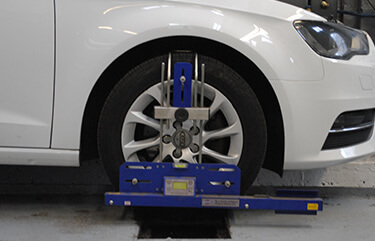 We can supply, fit and balance both budget and brand name tyres at competitive prices. 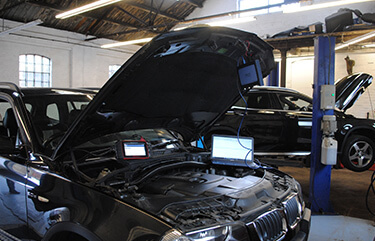 We use the latest diagnostic testing equipment to help ensure that we identify the correct fault quickly, saving you unnecessary expense and inconvenience. When repairs are required, we will provide you with expert advice, giving you all of the options available and the best price. It is vital that your timing belt is replaced as per manufactures recommendation. The cost of repairing an engine when valve to piston damage has occurred due to a broken timing belt is much higher than the cost of getting it replaced as recommended. It is also recommended that the belt tensioner, guild pulleys and water pump is also changed, which we can do whilst we’re completing the work. If you would like to receive news and notifications via email please tick here.